Love it or hate it, Disney isn’t going to let “Frozen” go anytime soon. And why should it? With over $1.3 billion in box office revenues, it’s the top-grossing animated film of all time. Last month Disney announced that “Frozen: A Musical Spectacular,” a live production featuring eight songs from the Oscar- and Grammy-winning original soundtrack, will debut on the 1,754-passenger Disney Wonder in November. We received a behind-the-scenes look at Disney Cruise Line’s rehearsal facility in Toronto to see how it stands up to the film. At “Frozen’s” core “is a feminist story … True love will thaw a frozen heart, and not the love between a man and a woman, but between two sisters,” says Tony-nominated Broadway director Sheryl Kaller. And though the cruise production lasts only 55 minutes, she promises the audience will not miss any of the film’s iconic moments. Broadway writer Sara Wordsworth (“In Transit,” “Dear Albert Einstein”) has excavated the essential nuggets of the original script, and the creative team has combined classic musical theater with modern video technology and special effects to make the story come alive on stage. Dance is also a key element of the storytelling process, and Broadway choreographer Josh Prince (“Shrek, The Musical” and “BEAUTIFUL – The Carole King Musical”) uses movement not only to express emotion, but also to advance the plot. How do you depict thousands of trolls when you have a cast of only 18? “We suggest a large mass of trolls with movement and let your brain fill in the rest of the troll-y rockin’ and rollin’,” Prince said. Tony Award-winning costume designer Paloma Young (“Peter and the Starcatcher”) designed every troll costume differently to represent the dysfunctional troll family in the film. Kids will adore the baby troll puppet who appears in “Fixer Upper.” Look for it in the cruise ship gift shops outside the theater. As he did for the Broadway production of “The Lion King,” Michael Curry designed puppets for key members of the cast, including child versions of Anna, Elsa, Kristoff, Sven the reindeer and Olaf the snowman. For Michael Mendez, the actor behind the Olaf puppet, this is the first time operating a puppet on stage, but he said working the three controls is like playing a videogame. Having paid close attention to the film’s details, he successfully uses the puppet’s subtle facial expressions to nail Olaf’s comedic timing. The creative team consulted with many members of the original film crew, including John Lasseter, chief creative officer for Walt Disney Animation, “Frozen”writer and co-director Jennifer Lee, art director Michael Giaimo, and, naturally, songwriters Robert Lopez and Kristen Anderson-Lopez. Not a fan of big ocean liners? 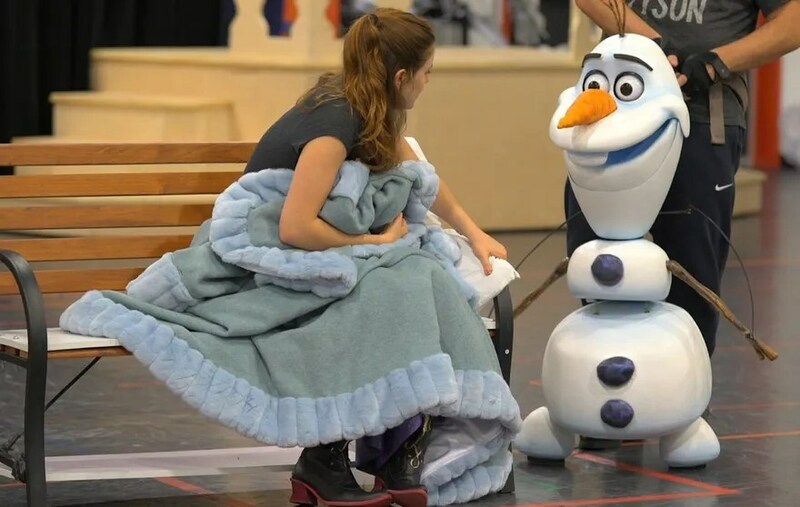 Catch Anna and Elsa on dry land in “Frozen – Live at the Hyperion” which debuted at the Disney California Adventure theme park earlier this summer, and “Frozen – The Broadway Musical” is currently under development for a summer 2017 pre-production run in Denver, leading up to a spring 2018 premiere in New York City. “Frozen: A Musical Spectacular” will be shown in the 977-seat Walt Disney Theatre aboard every sailing of the Disney Wonder beginning with the Western Caribbean cruise from Galveston, Texas, to Cozumel, Mexico, on Nov. 10. Dave Parfitt is a Rochester, N.Y.-based travel writer. He is the founder of Adventures by Daddy, a digital database offering family-friendly travel advice from a father’s point of view.